There he goes, Tennessee - get him! GOT HIM ... DeeeaaAAAAAD CENTER! 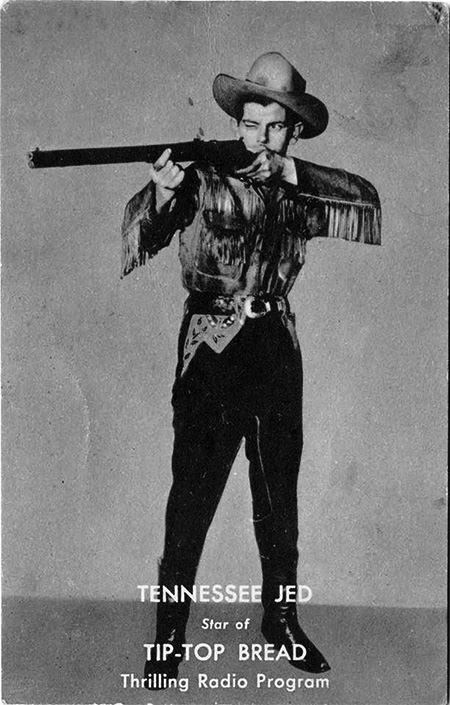 Johnny Thomas (and later Don MacLaughlin) starred as Tennessee Jed Sloan, the squirrel-gun-packing marksman, in this action-packed juvenile western serial. Along side him, his trusty horse, Smoky, traveled the western plains to fight fiendish plots. As the series progressed, Tennessee Jed became a Whitehouse agent working directly for the president to stomp out all evil. These rare recordings are truly entertaining. For kid's favorite cowboys, listen to Tales from the Diamond K, The Cisco Kid, and Wild Bill Hickok. 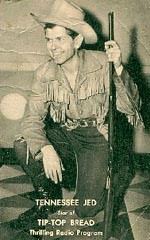 For western adventure, there are a bunch, including Gunsmoke, Have Gun Will Travel, Frontier Gentleman, and Six Shooter. 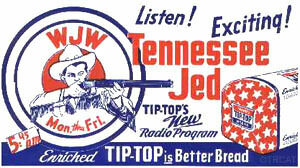 Be the first to comment on "Tennessee Jed"